This is our Electric 25 gallon sprayer which is ideal for outside jobs, termite applications and most type of landscape applications. 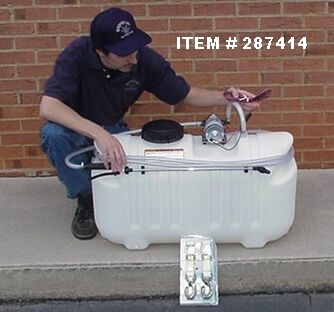 It features a Shurflo pump which is slightly more powerful than the 15 Gallon unit above and can pump up to 1.4 gallons per minute. It comes with the same spray wand as the 15 gallon, a hose that is 15 feet long and the same mounting straps. The hose fits perfectly around the top of the tank for easy storage and transport. There are two clips mounted on the tank which hold the wand in place when the hose is wrapped up. It comes with a quick connect for power so you can either hard wire it to an ATV or Tractor or you can add a pair of alligator clips allowing you to power it by attaching the clips to any 12 volt deep cycle battery. The pump has a pressure sensor which turns the pump off when the system reaches a certain pressure. This feature saves electricity by preventing continuous running of the pump.